We have been seriously lacking in the mirror department in our bedroom! The mirror we previously had in the room went with the old dresser that was in the room so when we moved the dresser out we also moved out the mirror. In the mornings I run into the spare room to check out my outfit. Since I am on vacation I decided it was time to do something about it! While sifting through the disaster that is our storage room (project for another day) I found a mirror that we had bought YEARS ago purely for the fact that it was $1... yes you read that correctly I said ONE DOLLAR! 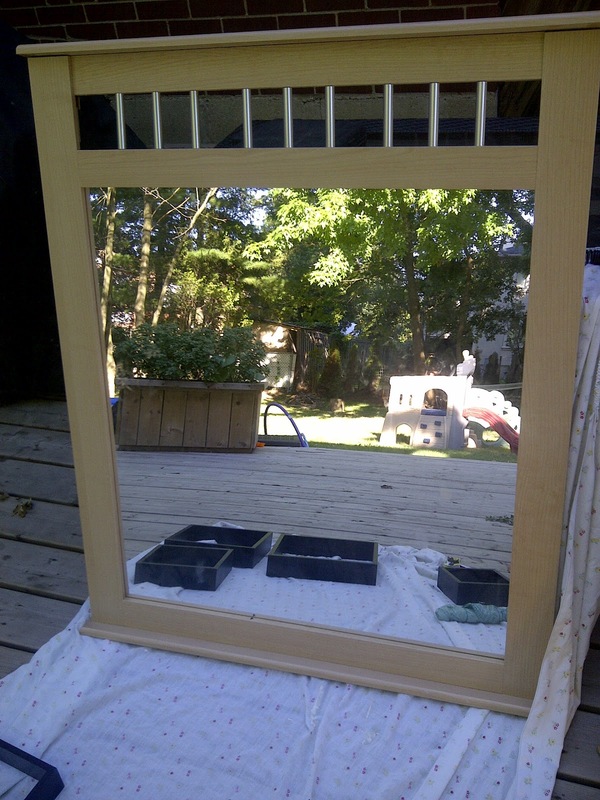 Just after we bought our first house we had gone to The Brick to look at mattresses and in the clearance section we saw two HUGE mirrors in perfect condition with a price tag of $1.00. We couldn't believe it so we found a sales person and low and behold they were only $1.00!!!! The only thing missing was the hardware to hang them. We took them home and the one mirror was in our kitchen in the old house and now hangs over our fireplace in this house. The other mirror was hung in the basement and basically just collected dust. UNTIL NOW!!! 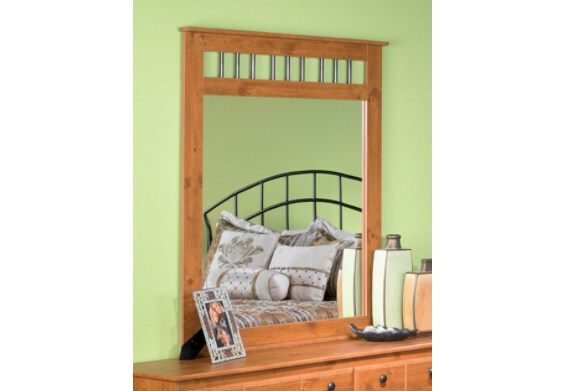 I looked up online how much this mirror goes for and found The Brick still sells it (in a pine finish) for $99.96. Awesome $1.00 find on our parts!! Here is our mirror. It is more of a white washed fake wood colour. I bought it outside and got to work on priming and painting it. 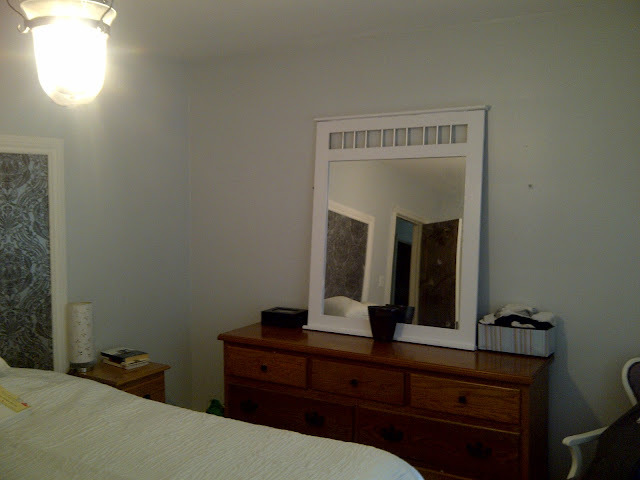 The current colour just didn't do anything for us and didn't go with anything in our bedroom so it was time to paint it! First I used Zinsser Cover Stain primer because I have been DYING to try it out on a few products! I wanted to test it out on small projects before moving onto a larger project with it. I plan on writing a review on it when I get a chance to let everyone know my opinions of it (I'm not paid/compensated by Zinsser in any way). So first I primed the mirror because I did not want to have to sand this puppy down!!! After one coat of primer I applied 2 coats of paint (letting each coat dry 12 hours before applying the next coat). And I was left with a wonderfully white mirror! Here it is in the bedroom!!! Now all I have to do is hang the purple paintings on either side and call it a day! !